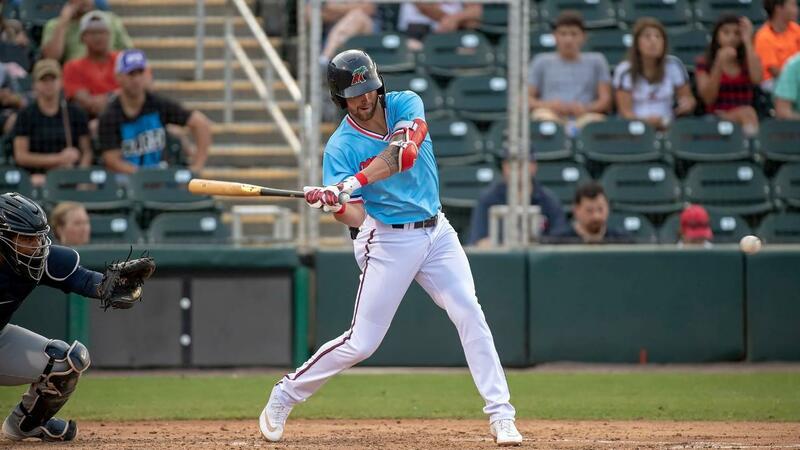 CLEARWATER, Fla. - Aaron Whitefield delivered an RBI single in the top of the 12th inning to lift the Miracle over the Clearwater Threshers, 5-4, on Friday night at Spectrum Field. Whitefield play a big role in getting the game to extra innings as well. With the Miracle down 1-0, he doubled to open the ninth inning. Akil Baddoo moved Whitefield to third with a ground out to second and Royce Lewis came through with a sacrifice fly to left to bring home the run. Whitefield was just able to sneak underneath the tag of Clearwater catcher Edgar Cabral. Each team scored once in the 10th inning and twice in the 11th. In the 10th, Michael Helman had a sacrifice fly to put the Miracle in front, 2-1. Then, in the bottom of the frame, Madison Stokes delivered a sacrifice fly of his own to tie the game. Travis Blankenhorn and Jose Miranda each drew bases loaded walks in the top of the 11th inning off Threshers reliever Zach Warren, but Clearwater's Ben Aklinski hit a two-run homer to send the game to the 12th. Johan Quezada (1-0) picked up the win in relief for the Miracle. The 6-9 right-hander hit 100 mph and struck out three in three innings of work. Alex Phillips earned his second save in as many opportunities. Tyler Watson started for the Miracle and allowed just one run on five hits in six innings. He walked one and struck out five. Clearwater starter Alejandro Requena allowed only one hit and a walk in six shutout innings. He struck out eight. Nick Dyer (0-1) suffered the loss in relief for Clearwater. The three-game series continues on Saturday night at Spectrum Field. Right-hander Bailey Ober (0-0, 0.00) will start for the Miracle.